In my last post I highlighted the stunning sage blooms along the driveway and today I'm taking a look back at the progress in the driveway landscaping project done during 2012. 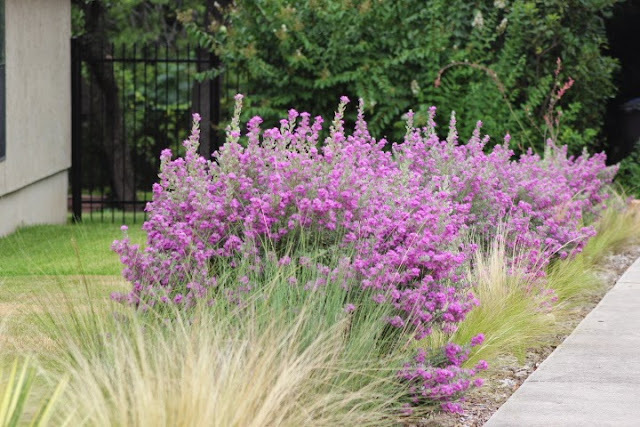 The Silverado Sage along the driveway are in bloom again and even more gorgeous than last year now they have matured. 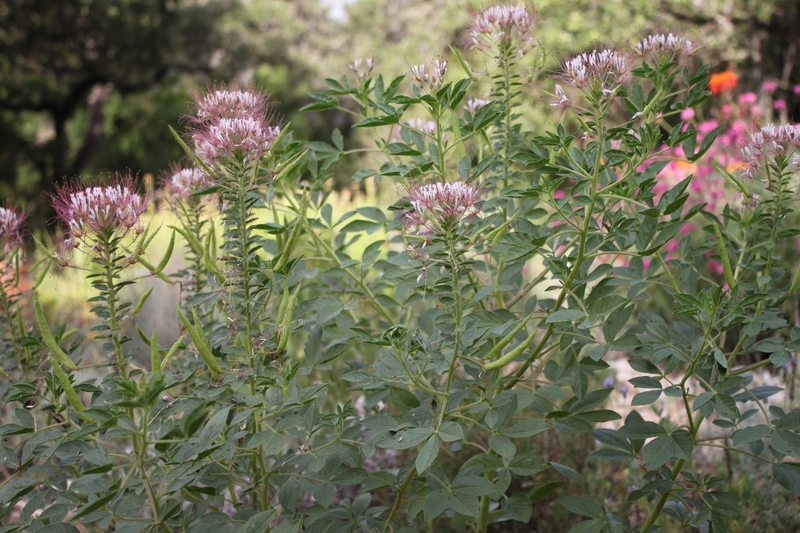 The Silverados have a deeper color than standard sages and are less leggy. Would you plant something named Clammy Weed in your garden? I certainly did, especially since it was shared by Michael at Plano Prairie Garden when I visited his beautiful garden back in May. I'm joining Gail at Clay and Limestone for Wildflower Wednesday where bloggers are invited to report on wildflowers in their gardens the fourth Wednesday of each month. When we replaced the fence and extended the perennial border around our buffalo grass lawn this past spring I quickly realized that something more was needed in the front left corner by the new fence. Regular readers will remember Ragna's garden from my previous posts and its presentation on local PBS gardening show Central Texas Gardener (CTG). Soon after the CTG crew finished, Ragna began making big changes to her back garden. She spent most of the last six months working on this major makeover which surprised many of us who loved the garden as it was. But her roses had been affected by chilli thrips and she did not want to go through the process of treating them with chemicals. 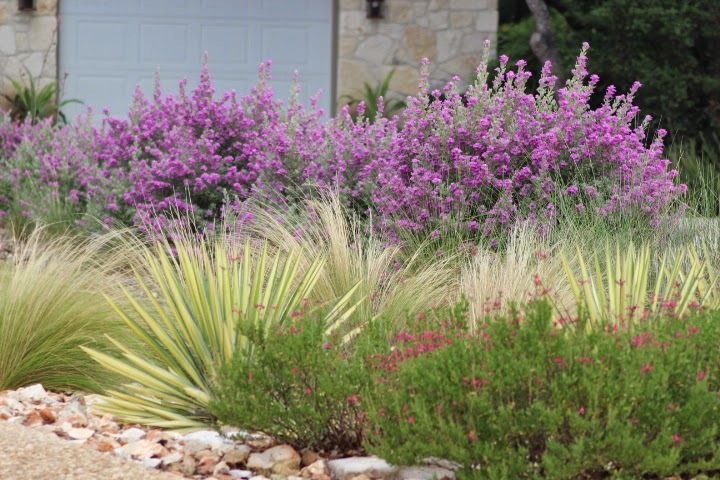 She was also ready to cut back on maintenance and add more waterwise plants. 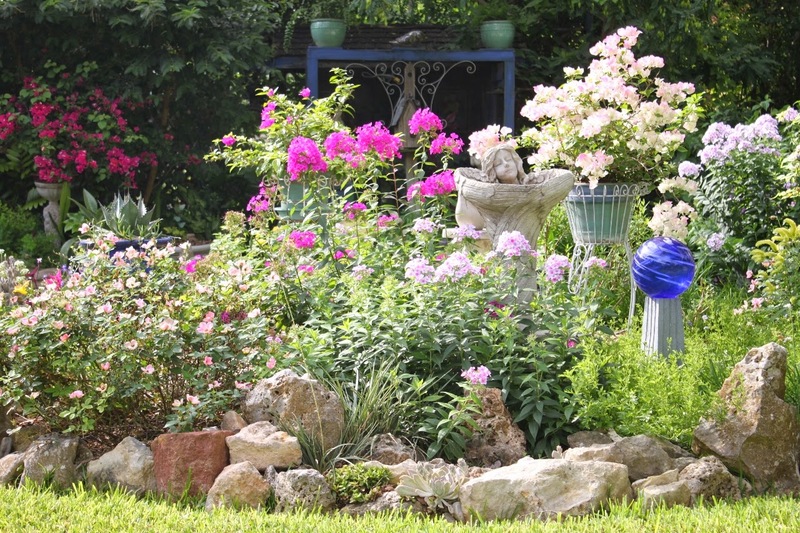 Here's a photo from last fall before she began removing the roses and making changes. My post from spring 2012 will show more of how the garden looked back then. Foliage Follow-up is sponsored by Pam Penick at her blog Digging for bloggers to highlight the foliage in our gardens on the 16th of each month. For July 2013 I'm highlighting some of my recent impulse purchases. I've never been much of an impulse shopper, preferring to stick to a plan for most of my purchases. I take the opposite approach when shopping for plants and purchase many plants on a whim, choosing whatever looks interesting, colorful, and fun at the moment I'm in the garden center. 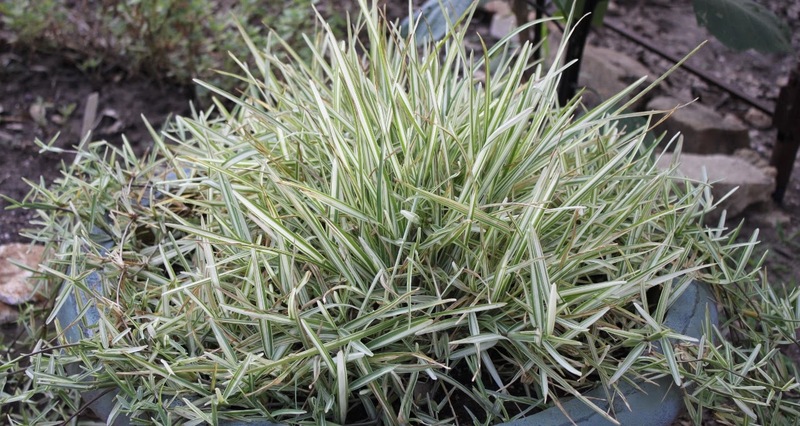 That's how I acquired this variegated St. Augustine grass. It's mid July and the garden has begun to slip into summer dormancy. With temperatures reaching 102F/38C over the weekend it's no wonder the garden is slowing down just like the rest of us. This is also Garden Blogger's Bloom Day and time to see what's still blooming before the flowers fade away for a few weeks. 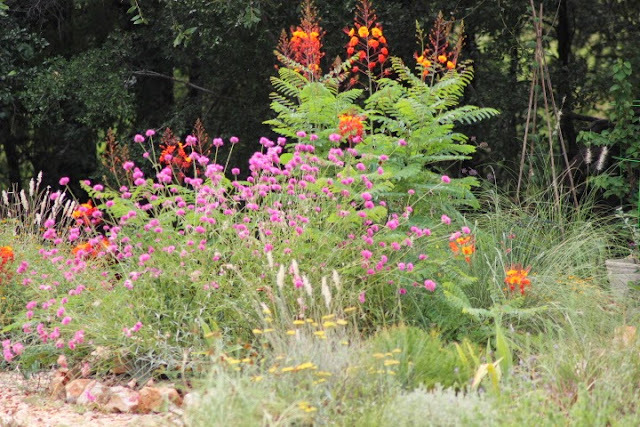 Each 15th of the month garden bloggers join Carol at May Dreams Gardens to see what's blooming. Many of the currently blooming flowers are hot and bright just like the weather. 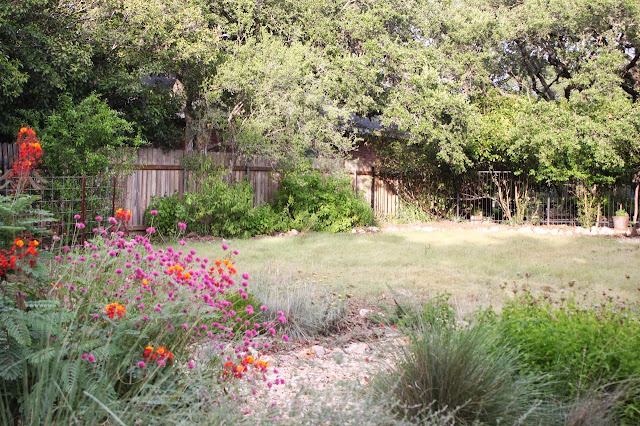 When I planned the circle garden in the back yard it wasn't with the specific intention of having a butterfly garden. 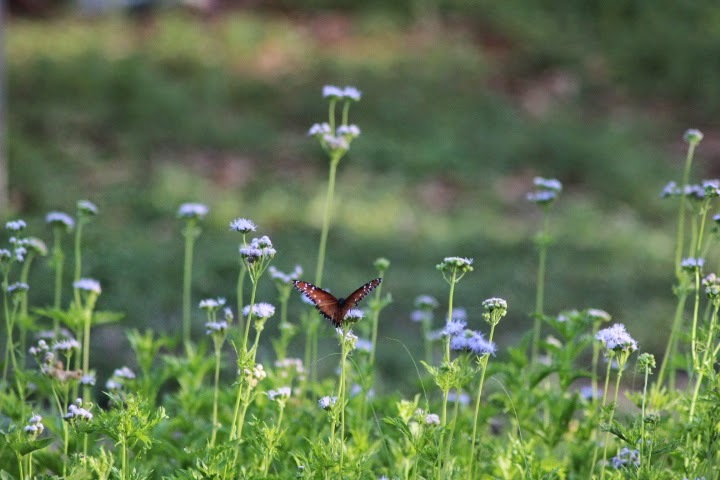 It just turned out that the best flowers for a hot, full Texas sun, low-water garden are also loved by our local butterfly population. Over the last two summers I've shown plenty of butterfly photos like the one below. Whooooo are you looking at? 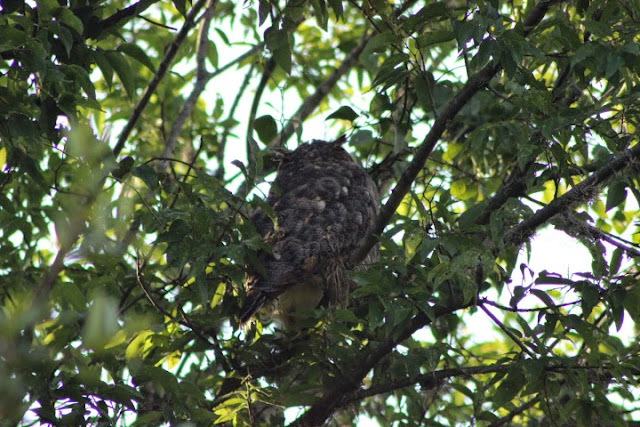 A family of Great Horned owls have nested in the trees behind the house this year. They were noisy at night during mating season and, being mostly nocturnal, we catch glimpses of them in the early morning but it's not easy to find them. Earlier this week hawk screams turned my attention to a large oak tree near the creek. Heading toward the sound, the hawk flew away and that's when I saw this owl which was apparently the object of the hawk screaming. The owl from the back, you can see his tufted ears. There are all kinds of fireworks around here on Independence Day. 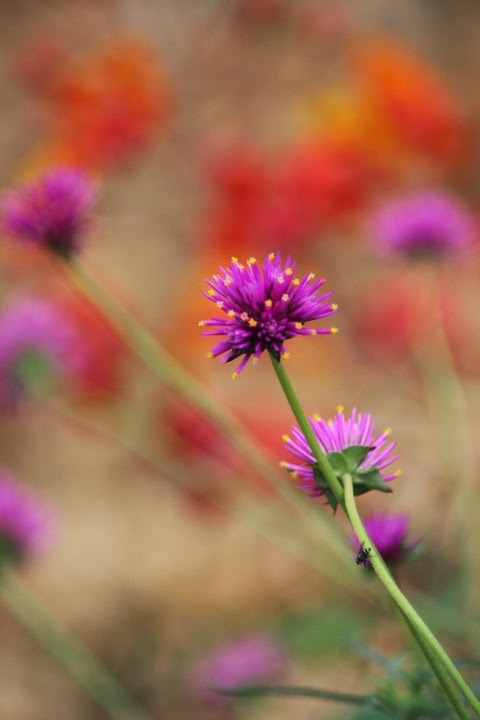 My favorite summer flower in the garden is Gomphrena 'Fireworks'. Improbably gorgeous color that doesn't fade in our intense sun and heat. I've never seen it wilt and it returned after our recent mild winter. 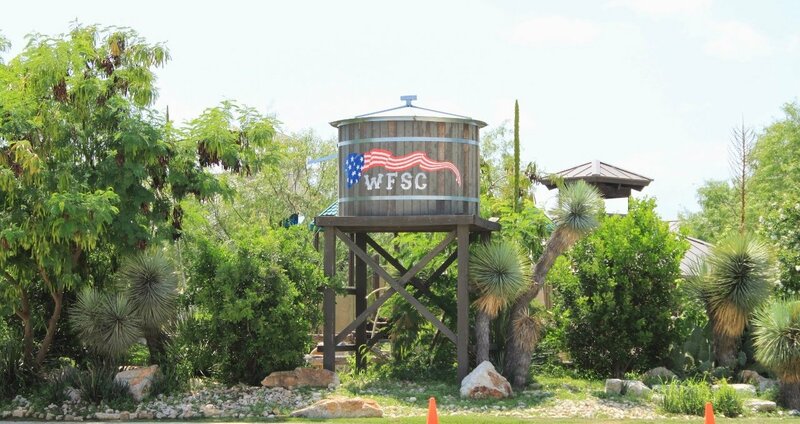 In honor of the Fourth of July holiday and those who have bravely served our country we're touring the gardens and grounds of the Warrior and Family Support Center (WFSC) at Ft. Sam Houston in San Antonio. 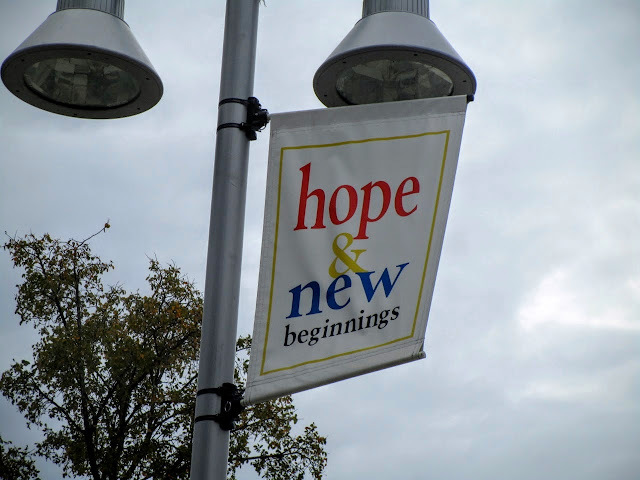 In my last post we toured the home-style healing and therapeutic gardens near the building. 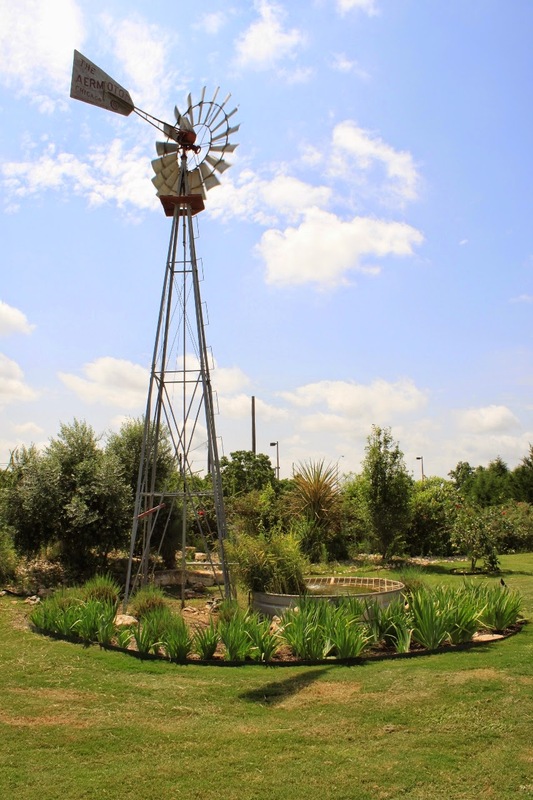 In this post we'll tour the beautifully landscaped outer grounds and the adjacent Freedom Park. The lovely gardens continue around the building and parking lot in Texas style with this windmill and tank pond garden. In honor of the Fourth of July holiday I am providing a view into the gardens of the Warrior and Family Support Center (WFSC) at Ft. Sam Houston in San Antonio. The WFSC is part of a complex serving those soldiers seriously wounded in combat and provides support for their families.